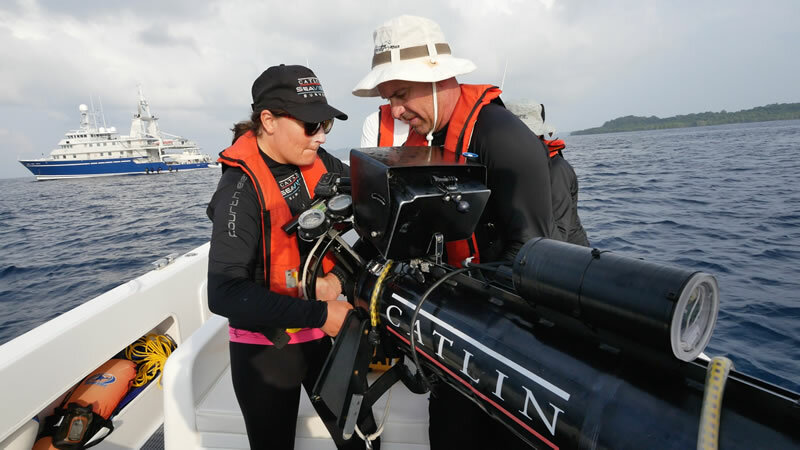 I am the Shallow Reef Team Leader this year for the Catlin Seaview Survey, working as part of the Coral Reef Ecosystems Laboratory at the University of Queensland. We have very similar goals to the Global Reef Expeditions, and this partnership has brought together a synergy of interests and methods. 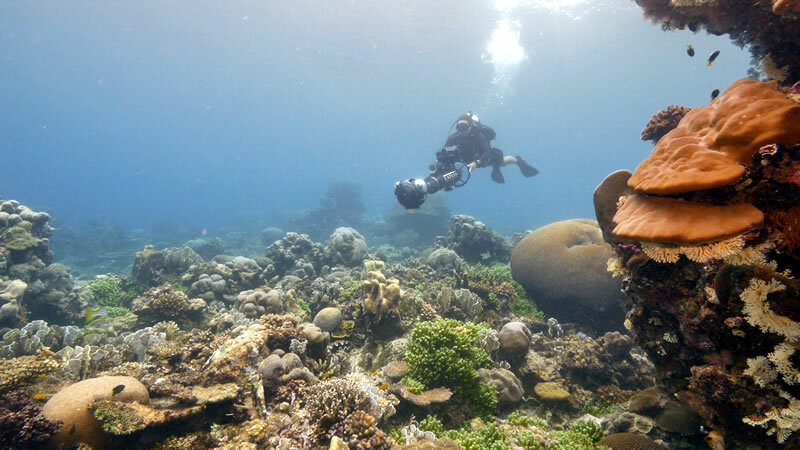 Our primary aim is to measure coral reef habitat diversity across the span of the tropics, and to use this information to understand how coral ecosystems may be changing across the world due to human pressures. 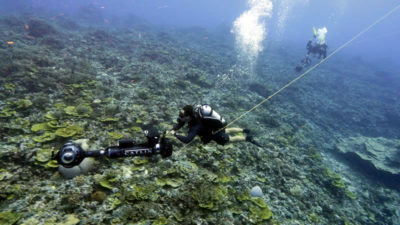 We use a unique propeller-driven, high definition, 360 degree panoramic camera system to document the reef across up to 6 kilometers per day, in a way very similar to Google Street View. Travelling in partnership with the Khaled bin Sultan Living Oceans Foundation on the M/Y Golden Shadow has allowed us to visit remote ocean areas we could not have accessed otherwise, and to do so with a community of researchers also interested in the very same topics, potentially setting the stage for future collaboration in data interpretation and publications, as well making for interesting and insightful dinner table conversations! 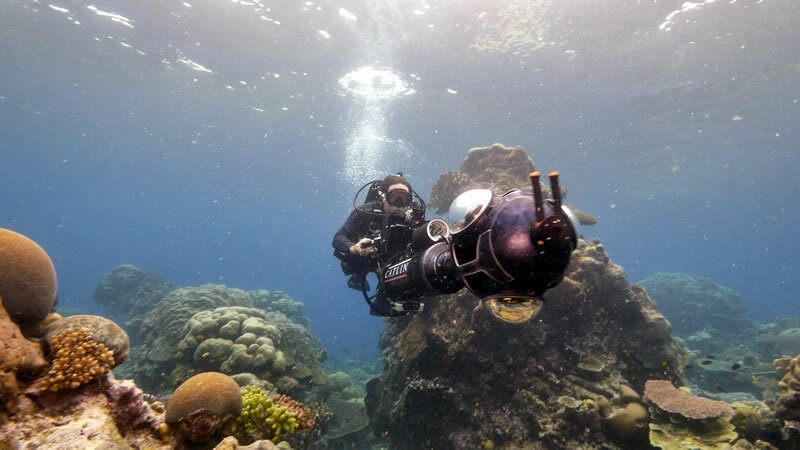 We use a custom panoramic camera system to gather images along the reef, with a head that houses three linked Canon 5D cameras, each with a separate 190° wide angle lense in dome ports, firing simultaneously every three seconds. 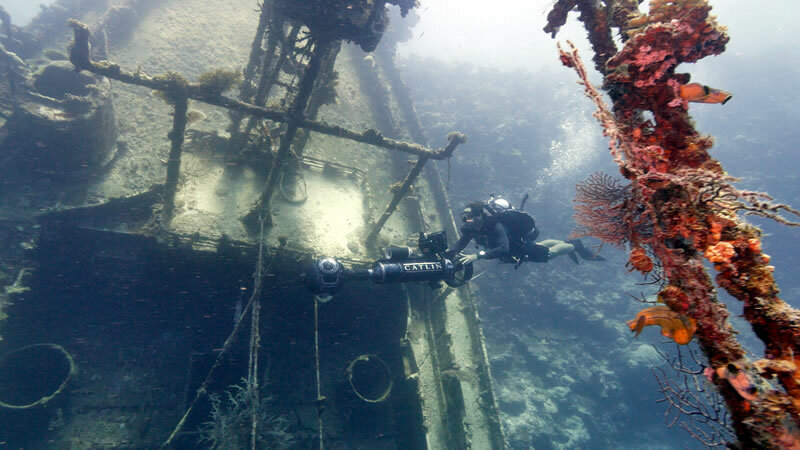 The camera system is driven through the water by an electric drive propeller, powered by a large battery, and guided by a diver on SCUBA. Further instrumentation includes an altimeter that records height off the bottom for every shot, a GPS position recorder, a depth and temperature gauge, a separate stereoscopic camera system facing downwards to record the shape and variation of the bottom, and an inertial sensor that gives an indication of camera angle and thus reef slope. 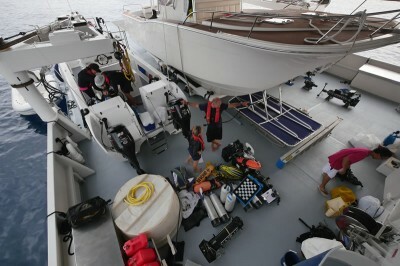 The whole rig is nearly 2m long, and weighs about 56kg. We can record up to 2700 panoramas each day, each of them recording the reef condition at a different location along our chosen track. 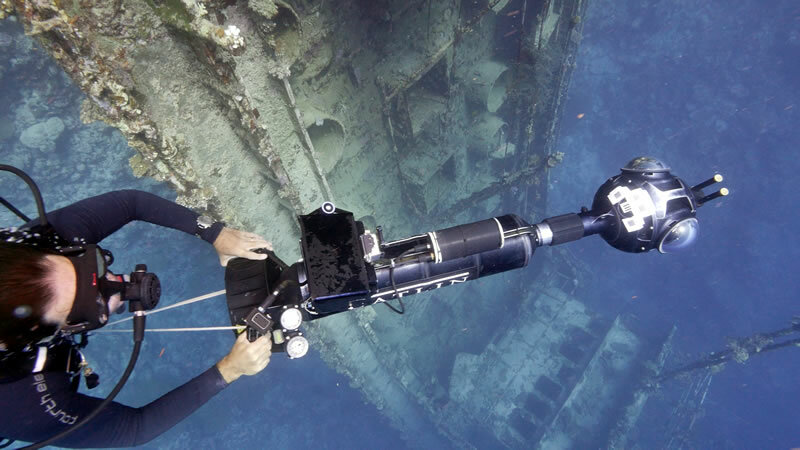 Examples of these panoramas can be seen as Virtual Dives at Catlin Seaview Survey website and on their own Google Views page. These interactive images have proven very popular, as they give a near diving experience for anyone with access to the web, including students of all levels, divers who want to see what it looks like in places they have not visited, and non-divers interested in the beauty and condition of coral reefs. This visual and personal engagement of the public in what marine conservation really looks like is an important goal of ours – we cannot expect legislators, voters, fishermen, or anyone to support preserving what they cannot see. We are also making all scientific data and images we are collecting accessible through an online research tool called the Catlin Global Reef Record, available to all for the future conservation and management of coral reefs. This information generated by both our project and the Global Reef Expedition will be particularly valuable for ongoing efforts in the Solomon Islands to establish a network of marine protected areas. This has been identified as a national goal in the Solomon Islands, which is building on a tradition of strong local tenure to codify community-managed regulations for fisheries and coral resources. Currently only 0.5% of the reef area in this country is officially protected, but there is promise to build on this to create a lasting system of protected areas that also support the needs of local small-scale fisheries. One such interesting location is the Morovo lagoon, the world’s largest double barrier reef lagoon system, which we will be visiting for three days on this trip. W.M. Davis, a geologist from Harvard University and one of the first comprehensive observers of tropical reef types, wrote in 1938 “the coral seas afford no finer exemplification of Darwin’s theory of barrier reef formation than Morovo”. The region has in the past been proposed as a World Heritage Area, while currently supporting considerable local subsistence fishing and a growing dive tourism industry. Sorting out these multiple potential uses in a way that ensures both conservation of biodiversity as well as future wild harvest of fish is a very thorny management task, and we are looking forward to surveying in this storied and interesting location, and to providing information that can be used to help refine and improve future conservation. Catlin Seaview Survey near a submerged shipwreck. The world’s oceans, and particularly coral reefs, are in danger everywhere from human pressures. The Living Oceans Foundation and the Catlin Seaview Survey both recognize the need to take a global perspective on this issue, as well as the vital importance of returning pertinent research findings to local residents and authorities to empower local conservation efforts. 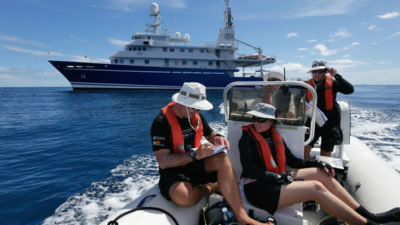 We share a belief that this multi-scale approach is key in understanding both fine-scale as well as global trends in coral reef conditions, and I am grateful to be on this expedition to the Solomon Islands with the M/Y Golden Shadow, working together to research and save the world’s imperiled coral ecosystems. Photos by Wade Fairley for KSLOF.